Holy cow, we made it. As 2019 arrived and corks popped around the world on Tuesday morning, you could be forgiven for forgetting that 2018 had been a tough old year. This time last year, I freely admitted that the BIT was entering 2018 big, bold, booming and badly organised. Assembling an airplane while it's falling out of the sky; building a hotel in a hurricane – 2018 was the year of colourful metaphors for working at the BIT. The common theme in all of them, I suppose, was 'barely constrained chaos… in media res'. I'm now told by others who have worked at young start-up companies that this is considered normal. Oh! Did I say start-up? I mean start-ups. Plural. Building projects, facilities development, accommodation and office management, space hire, licensed bar, event box office, online retailer and of course the theatre, its companies and productions themselves with all of the associated performers, props, wardrobes and technology. In 2018 we created half-a-dozen businesses, not just one. So now we've staggered over the 2018/19 line. What can we learn from the experience? How might we ring in the changes like it's the start of Peter Pan, rather than the end of Platoon. Looking at the list of things that the BIT will be dealing with in 2019, you would be forgiven for thinking that we're in for another long and terrifying death-ride (Part 2019: Electric-boogaloo). The theatre is in the midst of a (friendly but important) lease and funding deal negotiation with our landlords; it is experiencing rising operating costs along every front; it is grappling with increasingly complex systems of work and has greater staffing needs than ever before. The BIT also finds itself based in a city that is facing a small-arts-venue disaster. Yes friends, the future seems scary… but does it have to be? It's commonly said that Chinese has the same word for both crisis and opportunity. While that is not, in fact, strictly true, it is also not completely false. Of the component characters of the traditional Chinese word for 'crisis', the character 機 does indeed also feature in the word 'opportunity'. The two words share it between them. So what exactly is 機? Roughly translated, 機 means 'a moment where things change'. So when talking about the future (in China at least) things aren't so panda coloured. in other words, whether 機 overwhelms us, or inspires us depends on how we treat the offers 機 makes. When those moments come, are they an obstacle to our predetermined, doggedly-fixed and unmoving goals, or will we instead allow those moments to change us in turn? 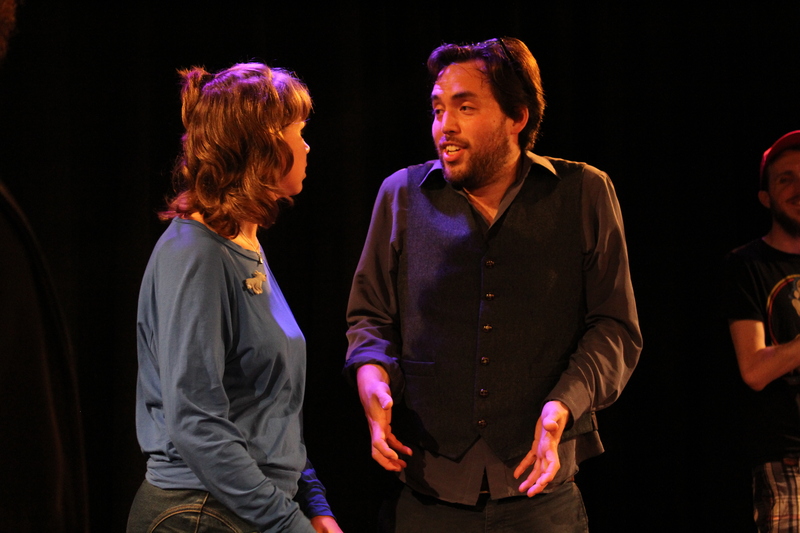 Fortunately, improv is an art form that revels in the unknown and in change. An improviser on the stage would try to embrace 機 when it comes, because she knows that in following her joy and responding to 機 in an authentic way, there is a chance for discovery, not just for her audience but also for herself and her fellow players. In order not to be confused, bewildered or otherwise thrown by 機, however, our improviser must be truly listening, be able and willing to move as freely as possible and have established some sort of consensus with those with whom she is experiencing 機. The BIT is much the same. Whether it's organisational mission or our burgeoning community – All of the the things I love to talk about in this blog are ways in which the BIT, as an organisation, can stay as present, open and agreeable as our talented improviser. As I have shown, the BIT needs these tools in place, to experience each decision moment collectively and safely, but it also must avoid fixing too much, lest it lose the vitality of what has been created. When the focus is on establishing control, the anxiety of not having it returns. But if we get the balance right the BIT need not fear 機 at all. Lest we forget, when the theatre was founded, it was already breaking new ground, by fact of its mere existence. In 2019, the year that feels like anything might happen, I have a sneaking suspicion that the BIT going to surprise us once again – if we allow it. So I guess that's my New Year's Resolution for 2019: To embrace 機. Also to occassionaly go to the pool. The BIT is participating in the 2019 Culture Flash Sale!